Home » Diner vs. Dinner: What’s the Difference? For their annual Christmas dinner, the diners ate dinner at a local diner. This is a perfectly grammatical sentence, albeit a somewhat confusing one. If it were part of an academic or professional piece, it would need to be rephrased. Still, it illustrates the point that words with more than one meaning can make English difficult to understand. Diner and dinner are nouns with multiple senses that are all related in some way to food. As you can see, this commonality can be a source of confusion. This article will help you decide whether to use dinner or diner, and when each word is correct. 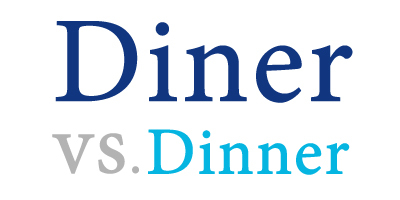 What is the Difference Between Diner and Dinner? In this article, I will compare diner vs. dinner. I will use each word in a sentence to illustrate its proper context, and, at the end, I will discuss a useful trick to help you remember whether the word you’re using should be diner or dinner. What does diner mean? Diner is a noun, with three common meanings. A diner is usually either a person who is eating or a small restaurant serving simple American cuisine. A diner could also be a car on a train where food is served. These cars are also called dining cars. Due to the popularity of air travel, this usage is growing less commonplace. You can see examples of the word diner in the sentences below. Let’s eat at that little diner on 28th and Burnside; I think it’s called Holman’s. The diner at table three finished his meal and asked for the check. When the train derailed, all the food in the diner spilled, creating a big mess. What does dinner mean? Dinner is also a noun. It refers to a large daily meal. In most cultures, dinner is eaten either at midday or in the evening. Dinner also refers to a large formal gathering at which a meal is eaten, usually in honor of a person or to commemorate a special event. In this case, it becomes a synonym of the word banquet. Tell the children to come inside; it’s time for dinner. I received an invitation to the White House Correspondents’ Dinner, but I did not attend. Here is a helpful trick to remember dinner vs. diner. A diner is either a person, a restaurant, or a train car. Dinner is either a meal or a gathering around food. Therefore, if you’re referring to a person or place, diner is the correct word. To describe a meal or an event, you would want to use dinner, instead. You can remember that dinner refers to a meal since it shares a double N with the word anniversary, and anniversary dinners are a popular tradition among married people. Is it diner or dinner? Diner and dinner are similar nouns that all related to food in some way. A diner refers to a person who is eating, a certain type of restaurant, or a train car where food is served. Dinner is an important meal, or a formal gathering around food. You can remember to save dinner for occasions involving a meal by remembering the double N in the words anniversary and dinner. If you still need help, you can always check this article again for a refresher. 1 What is the Difference Between Diner and Dinner?